Hillsboro Animal Hospital has been working with several pets to help regain normal function with physical rehabilitation. Our doctors use range of motion stretching along with a theraputic laser to help patients with mobility problems. We have had wonderful results with osteoarthritis, muscle degeneration, post-surgical patients and neurologic patients. 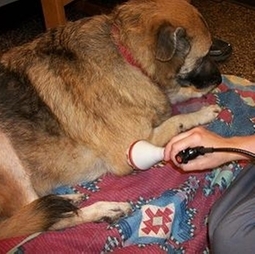 For certain animals, laser therapy can improve pets' quality of life drastically.